B. 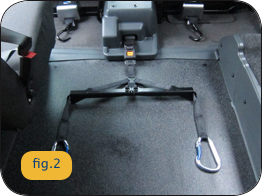 The control for the winch is located at the rear of the vehicle (fig.1). Holding the winch bar (fig.2) guide the strap down the ramp using the ‘out’ arrow button on the remote control (fig.3) until the winch bar is at the bottom of the ramp, ready to attach to the wheelchair frame. 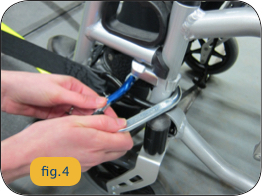 C. Attach the winch to secure points on the front frame of the wheelchair using the clips (fig.4). Many people prefer this to be attached beneath the foot rests, although this may not always be possible with all models of wheelchair. 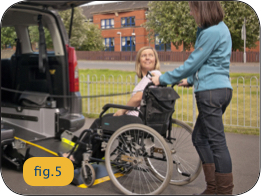 D. Stay behind the wheelchair holding the handles as the wheelchair user ascends the ramp (fig.5). 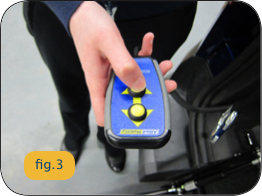 The ‘in’ and ‘out’ buttons on the remote control can be used to adjust the positioning of the wheelchair inside the vehicle as required. Once inside, ensure the wheelchair is secure and detach the winch bar. Put the remote control back in its holder. 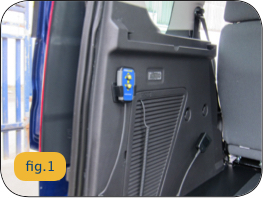 You are now ready to attach the rear restraints as detailed on page five of your user guide.